A vulgar anti-NATO inscription in Serbian was seen Thursday morning on the outer wall of the Parliament Palace in Bucharest, at the media entrance. 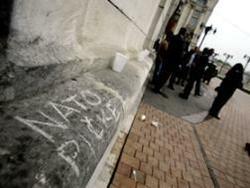 The inscription, which read “NATO picke” was noticed by journalists Thursday morning. As soon as cameramen started filming the inscription, colonel Adrian Nica of the Security and Protection Service, or SPP, stood in front of the respective wall to prevent media from filming or taking photos of it. Under media pressure, Nica moved and called administrative personnel to cover the inscription. A member of the cleaning staff arrived shortly and washed the inscription off the wall.